2:51 p.m., Nov. 5, 2008----The University of Delaware, hailed as the “epicenter” of the national election campaign by Bloomberg News, played a major role in Tuesday's presidential election outcome. Front and center, the vice president-elect is University of Delaware graduate U.S. Sen. Joseph R. Biden Jr.
Biden's wife, Jill Jacobs-Biden, is also a UD graduate, and both joined Democratic president-elect Barack Obama in a celebration at Grant Park in Chicago late Tuesday night. Biden received his bachelor's degree, a double major in history and political science, from UD in 1965 and an honorary degree in 2004. 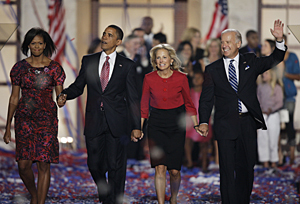 Jill Biden is a 1975 graduate who also received her doctorate in education from UD in 2006. The Bidens kicked off the stretch run of the campaign with a rally on the steps of the University's Memorial Hall on Oct. 31. “In 1965 I graduated from a great university,” Biden told about 6,000 cheering supporters who had gathered at the same location where his Commencement ceremony was held. “This place just keeps getting better and better and better and better and better and better. “It's an honor to be back on campus, a campus that literally, not figuratively, played such a significant role in shaping my life. During my years on campus here some of the most transformative events of my generation took place." During his speech, Biden noted that also playing key roles in the 2008 election were Steve Schmidt, senior adviser to the campaign of Republican John McCain, and David Plouffe, campaign manager for Obama. "I am proud that this great University has instilled that kind of intensity in its graduates, in its students who are here,” Biden said. Schmidt attended the University from 1988 to 1993 as a political science major and Plouffe was a student in the UD political science department from fall 1985 through fall 1988. In Obama's victory speech, he congratulated McCain and his running mate, Alaska Gov. Sarah Palin, for a hard-fought campaign. He then turned his attention to his own running mate. “I want to thank my partner in this journey, a man who campaigned from his heart, and spoke for the men and women he grew up with on the streets of Scranton and rode with on the train home to Delaware, the vice president-elect of the United States, Joe Biden,” Obama said.